One of the many shrines in Kyoto Japan. This month we discuss what we hope is our first of many traverses to the continent of Asia. Hence why we called this episode ASIA Version 1.0. Jeff M (who lived in Asia and traveled the continent for six years) and Chelsea C (recently back from a six month trip to Asia) join Mike and Amy for a deep dive on the best of the best on this magical continent. We hope you enjoy the Asia V1.0 Podcast! Special thanks to Hopewell Works our recording sponsor! Don’t forget to listen in to our podcast profiles and check out our show notes below! Jeff M balling in the PI on Easter Sunday, notice Mike R giving a strong base on defense. 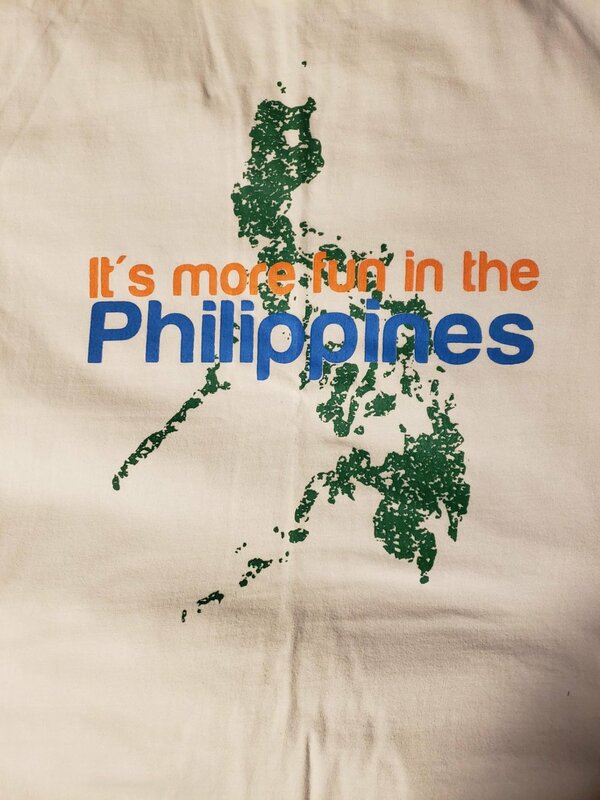 As promised from the podcast here is Jeff M’s tee, true to the country tourism slogan! Check out Chelsea C’s blog HERE. Check out Jeff M’s wife Heather’s blog on their time living in the PI HERE. Jeff M’s favorite city in Asia is Taipei, learn more HERE. Blue Fire Volcano Tours can be found HERE. Read about Hong Kong HERE. Read about Mike R’s trip to the PI HERE. Read about Tips and Tricks in Japan HERE. Listen to our budget travel podcast HERE. Don’t believe us about using coconut milk? Check out these recipes HERE. There are over 18,000 islands in Indonesia if anyone is interested! Thanks for tuning in to our Asia Version 1.0 Podcast! What is one place in Asia that you would love to visit? Comment below!